Over the last week or so, I’ve seen and heard a lot of parents grumbling about the exorbitant cost of buying school clothes for their kids for the upcoming year. A few parents are at least putting all of their eggs in the basket of the upcoming tax holiday on clothes in Iowa – and they’re quite proud of this, certain that they’re getting a better deal than everyone else. Guess what? If you put in a little bit of time, you can get your kids plenty of clothes for just pennies on the dollar – and it’ll be exactly what they pick out, too. Even better, the same exact strategy works for your own clothes shopping – this is the way to get cheap clothes. If you’re buying clothes for reasons other than the quality of the material and how they look on you, then don’t bother with these tactics. You’re not buying clothes for clothes’ sake – you’re buying clothes for the sticker on the sleeve or for some label-based self-esteem boost. If you’re buying a $500 pair of worn-out denim jeans that are identical to a $1 pair of worn-out denim jeans except for the tag on the back pocket, a clothes-shopping strategy like this isn’t going to work for you. Or, better yet, I have some cool labels I’d love to sell to you. Here’s the deal: the first big key to getting inexpensive clothes is to ignore who made it and where you bought it from. All that matters is how it looks on you and how durable it is. The company that produced it doesn’t matter. The store where you bought it doesn’t matter. All that matters is how well it does the job: does it look good on you and will it hold up reasonably well? That’s all that matters. If you try to introduce a plan like this to a teenager who has become accustomed to sparkling new clothes every fall and needs to have only clothes bought at whatever the “cool” store is this year (Abercrombie and Fitch? Or is that “so 2007” now? I fail at keeping up with such things.). Instead, start doing this strategy when they’re very young and they’re largely content with anything that matches just a few basic aesthetic choices. For example, my son is happy with any t-shirt or dress shirt that isn’t too tight around the neck, though he has a slight preference for t-shirts with basketballs on them. That means buying him clothes is about as easy as can be. On the other hand, my niece can go through an entire clothes shop and say that nothing whatsoever meets her exacting standards. All along, she’s been raised on clothes shopping with J.C. Penney at the extreme low end (and who knows what at the high end). Today, she wouldn’t be caught dead in anything that doesn’t come out of a shopping bag from an appropriate store. Not cool. Nip that in the bud early, folks. If you want success in finding cheap clothes, let the kids themselves have some influence on the picks. Sure, I might wind up with several shirts that depict basketballs, but if they’re dirt cheap and coupled with other diverse purchases, who cares? Getting them involved means they’ll have a lot more joy in what you bring home, no matter where it came from. This might mean a Goodwill shop, a yard sale, or a second hand clothes shop (even better: it might start with hand-me-downs or a clothes swap with a friend or a relative – use those opportunities before heading out to actually buy anything). This should be your first stop on any large clothes-buying excursion. Remember, you don’t have to even buy a single thing in the shop. All you have to do is go in the door with an open mind and see if you can find anything that works for you. If you can’t, no big loss. If you stumble upon some items that fit and are in very good shape, you’re suddenly spending maybe 5-10% of what you would have spent elsewhere. 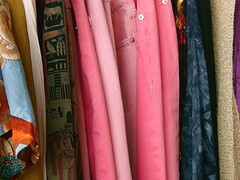 After you’ve hit the local secondhand shops and yard sales, try some consignment shops. If you don’t find what you want there, go to low-end bulk clothes shops (like Frenchy’s) if they’re in your area. Keep going up a bit at a time in quality, buying whatever you see that fits your needs. Then, just finish off whatever you need to fill out the wardrobe at a normal retail outlet on a tax free holiday – ideally, you’ll have taken care of most of your needs. If you wander through a very low-end store and only find one item of acceptable clothing, so what? If you do it at several low-end stores, you have the foundation of a wardrobe for just pennies on the dollar, with only the supplemental items paid for at full price. If you’re able to save $5 per item on average over twenty items per child and you have two children (as I do), you’ve just saved $200 – and you’ve probably found a few items for yourself – and you’ve taught the children how to be thrifty shoppers. Sounds like a great way to spend a Saturday to me.